Kinases have formed a strong focus of recent work in pharmaceutical research and at BioPredict. This focus is exemplified by our continuing work with one client company, TargeGen. By using modeling to propel medicinal chemistry this work has propelled compounds to late stage preclinical development and into clinic for several kinase targets in a few short years, demanding very few compounds to be synthesized. Our initial work targeted the SRC kinase. SRC is implicated in a number of disease states including myocardial infarction, stroke, osteoporosis, neurodegeneration, metastases and tumor progression particularly those of breast, metastic colorectal, ovarian and pancreatic cancers. While crystal structures existed of the inactive (unphosphorylated) kinase, no crystals were available of the active (phosphorylated) kinase. We began by building a homology model of phosphorylated SRC. A key glutamate on the C-helix that has been implicated as contributing to the activation mechanism of SRC is present deep within a hydrophobic pocket at the back of the ATP binding site in activated but not in prior cystals of inactivated SRC. A strategy was devised to leverage an interaction with this residue. The strategy proved quite powerful, resulting in one to two orders of magnitude increases in affinities in several series of compounds when this key interaction was introduced. The strategy has subsequently been generalized to structurally related kinases with similar success, including VEGF, Bcr-Abl, and the Gleevec, Tasigna, and Sprycel resistant T315I mutant of Bcr-Abl. A next step in SRC modeling was to propose that SRC could undergo similar conformational changes to those induced in ABL by Gleevec, despite lack of prior crystallographic or medicinal chemical evidence. In ABL these changes open up an extension to the hydrophobic pocket that accommodates the large Gleevec ligand. Using prior TargeGen series as a starting point, compounds were designed to penetrate this Gleevec-like channel in SRC by modeling the compounds into multiple models of SRC that sampled protein flexibility in this region. The result was a novel, high affinity, highly specific series of compounds to SRC to augment the previous series described above. Other work on other kinase targets with TargeGen has generated high affinity and isoform selective series of compounds against PI3K and JAK. In several of these cases crystals have been obtained and in each case confirmed the binding modes proposed by modeling. A strong pipeline of compounds in late stage development and in clinic has resulted from the work described by our client Targegen. Results have been discussed in conference presentations and posters and in journal articles (see Publications section of this web page). It is worthwhile noting that the use of our proprietary software proved crucial to the successes of these projects. This is because compounds developed required targeting multiple conformations of the proteins not observed in previous crystal structures. The use of multiple models in modeling and docking has been a focus of internal grant-funded software development, and has provided us with a facile ability to generate structural hypotheses and to suggest avenues to pursue them with chemistry (see Technologies section of this web page). The starting point was a collection of positives and negatives from a client's internal screens to a nuclear receptor. These positives and negatives were docked to the crystal structure of the receptor to develop a structure-based SAR. This SAR was then used to guide medicinal chemistry efforts to increase potency, lower cross reactivity, and lower unwanted side effects in animals. Patent applications were filed covering the series. The series was subsequently partnered for development to a U.S. Pharmaceutical company. 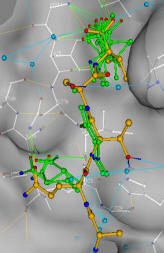 A follow-on fragment-docking screen was then performed to identify fragments to bind to important regions of the binding site. These fragments were linked together to suggest new backup compound series for synthesis. Of ten such designs a number were active and one of these was later optimized to high affinity. A patent application was filed covering this backup series. The resulting SAR was used to design a hit-to-lead combinatorial chemistry library that further optimized activity of the series. Patents were applied for on the lead series. Enriching the selection of compounds submitted to HTS screens using ligand-based methods. Enriching the selection of compounds submitted to HTS screens using structure-based methods. Hit tracking confirmed a significant increase in the fraction of hits in derived from the above methods. Selecting compounds to augment internal compound libraries based on diversity and on target classes. Identifying compounds using structure-based methods to avoid known mutations in desired targets. development, by demonstrating that activities were not due to toxicophore-containing portions of the molecules.